In 1871, American artist Thomas Moran accepted an invitation to travel to Montana to be part of a team completing a U.S. government survey of the Yellowstone region. His color sketches captured the grandeur of the area and are widely credited with helping to convince Congress and President Ulysses S. Grant to establish the country’s first national park one year later. 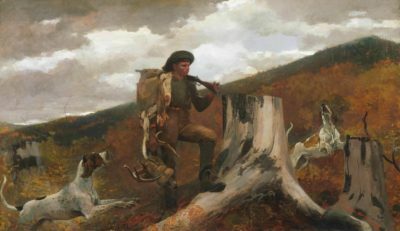 The artist returned to the captivating landscape as a subject for many years, and even took to signing his paintings “TYM,” for Thomas “Yellowstone” Moran. Yet some contend his popular portrayals of this iconic landscape, including the painting Lower Falls, Yellowstone Park, perpetuated problematic beliefs about nature as a pristine and untouchable environment that is separate from the rest of us. The painting also remains silent to the fact that many Indigenous people were forcibly removed from these lands to make such a federal designation possible. Winslow Homer, American, 1836–1910, A Huntsman and Dogs, 1891. Oil on canvas. Philadelphia Museum of Art: The William L. Elkins Collection, 1924. 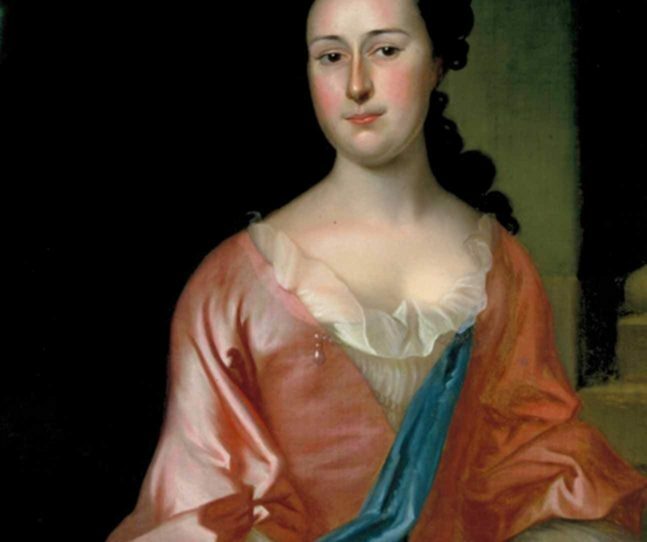 Organized by the Princeton University Art Museum, Nature’s Nation: American Art and Environment presents more than 100 outstanding works of American art from the colonial period to present day from more than 70 lenders. The exhibition encourages audiences to consider how artists continue to influence our perceptions of the environment and our relationship with it. Featured in the show are nearly 50 paintings, along with photographs, works on paper and sculpture, by leading American artists such as Ansel Adams, John James Audubon, Albert Bierstadt, Frederic Edwin Church, Thomas Cole, Winslow Homer, Dorothea Lange, Kent Monkman (Cree), Georgia O’Keeffe, Jaune Quick-to-See Smith (Salish-Kootenai) and Andrew Wyeth. Also on view are 22 key works from PEM’s Native American collection, an inclusion that reflects the museum’s ongoing initiative to blend boundaries between Native and American art. 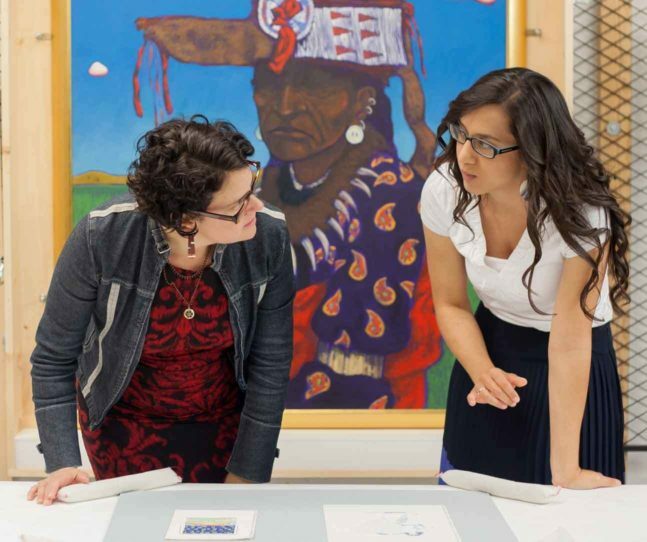 Karen Kramer, PEM’s Curator of Native American and Oceanic Art and Culture, was instrumental to the development of the presentation of the exhibition at PEM with Bailly. PEM’s Mellon Native American Long-term Fellows Rachel Allen and Frank Redner also contributed research and expertise. 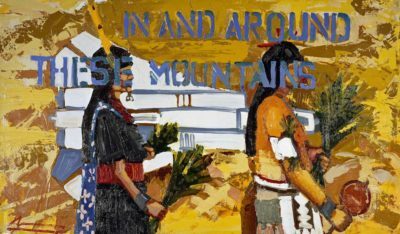 Mateo Romero, Cochiti Pueblo, b.1966, In and Around These Mountains, 1999. Oil, paper, canvas. Donated by the Margie and James Krebs Fund, 1999. © Peabody Essex Museum. The exhibition catalog includes a separate essay by Miranda Belarde-Lewis (Zuni/Tlingit) on a rare Chilkat robe from the PEM collection that is featured in the show. Created by a Tlingit female artist, the robe is made entirely from materials local to the weaver: cedar bark woven with mountain goat wool. Its black outlines depict a killer whale that contains within it a pod of killer whales, whose spiritual energy the wearer absorbed, indicating a connection between human and nonhuman life. 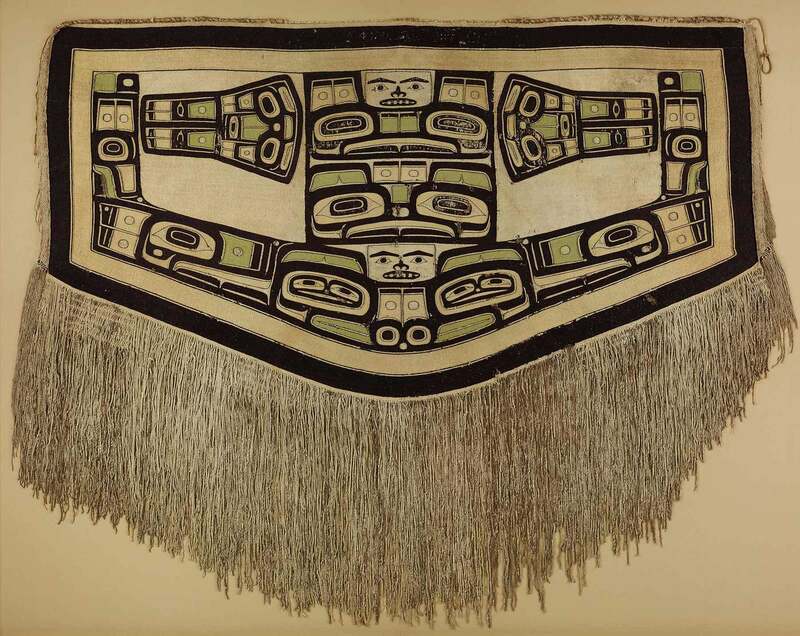 Tlingit artist, Chilkat blanket (detail), before 1832. Mountain goat wool and cedar bark. Gift of Captain Robert Bennet Forbes, 1832. © 2010 Peabody Essex Museum. Photography by Walter Silver. Indigenous people have never held this view that humans are separate from nature. There is an interconnectedness to everything,” said Kramer. “To view wilderness as this separate entity is a farce and creates major disconnects, which leads to human environmental catastrophes. Nature’s Nation begins with a floating yellow sphere by Postcommodity from their installation Repellent Fence/Valla Repelente. 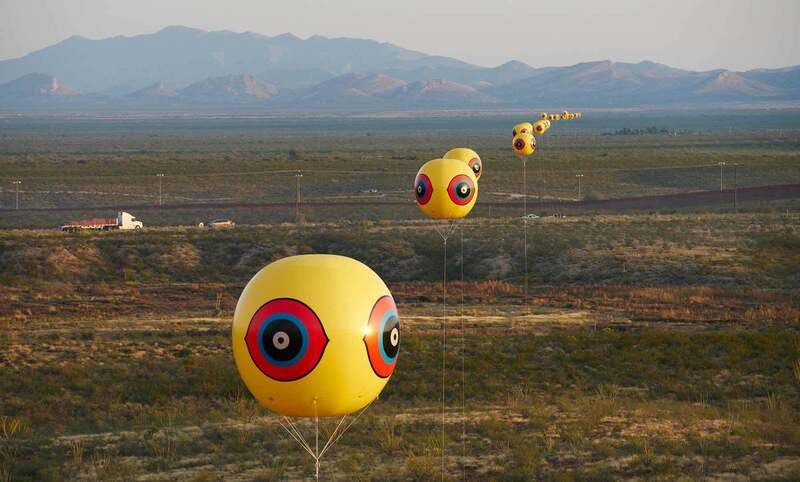 In October of 2015, this trio of Indigenous artists installed 26 tethered “scare eye” balloons, each 10 feet in diameter and floating 100 feet above the desert landscape, to create a 2-mile-long installation across the U.S.-Mexico border. The choice of the balloons, which are widely considered to be ineffective to repel wildlife, provided a critique of borders between land, communities and ecosystems. Postcommodity, Repellent Fence/ Valla Repelente, 2015. Installation view at U.S./Mexico Border, Douglas, Arizona/Agua Pieta, Sonora, 2015. © Postcommodity. Photo by Michael Lundgren. Courtesy of Postcommodity and Bockley Gallery. 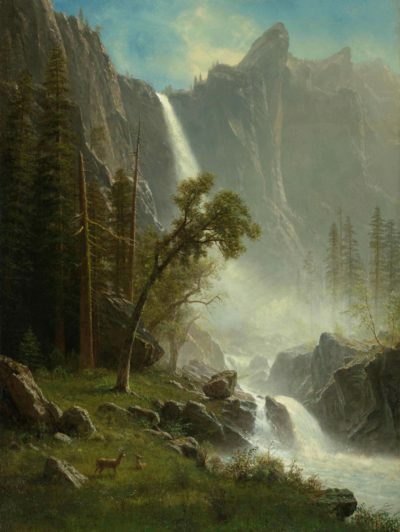 Albert Bierstadt, American, 1830–1902, Bridal Veil Falls, Yosemite, ca. 1871–73. Oil on canvas. North Carolina Museum of Art, Raleigh, Purchased with funds from the North Carolina State Art Society. (Robert F. Phifer Bequest) and various donors, by exchange. Yellowstone is not the only national park represented here. Painted from 1871 to 1873, Bridal Veil Falls, Yosemite by Bierstadt presents an awe-inspiring view of the thunderous falls. 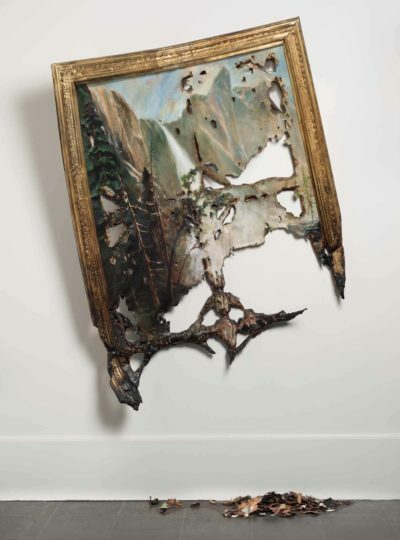 Contemporary artist Valerie Hegarty looked to Bierstadt to question the way traditional landscape painting idealizes nature. Her Fallen Bierstadt, a deconstructed view of the iconic painting, imagines nature as something more in flux and fragile. Valerie Hegarty, American, born 1967, Fallen Bierstadt, 2007. Foamcore, paint, paper, glue, gel, medium, canvas, wire, wood. Brooklyn Museum, Gift of Campari, USA 2008. © Valerie Hegarty. The exhibition features many artists who have expressed environmental injustices. 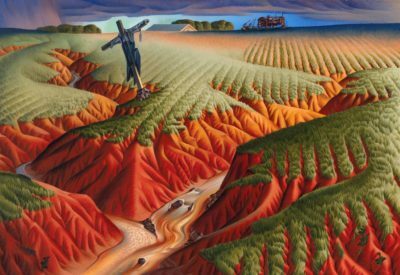 Alexander Hogue’s vivid 1939 painting Crucified Land pictures the desiccated furrows in earth symbolically sacrificed by overfarming in the Dust Bowl era. The more recent work of Subhankar Banerjee — aerial photographs of migrating caribou — challenged perceptions of the Arctic National Wildlife Refuge as an empty wasteland ripe for petroleum extraction. Alexandre Hogue, American, 1898 - 1994, Crucified Land, 1939. Oil on canvas. Gift of Thomas Gilcrease Foundation, 1955 Gilcrease Museum, Tulsa Oklahoma. © Estate of Alexandre Hogue. 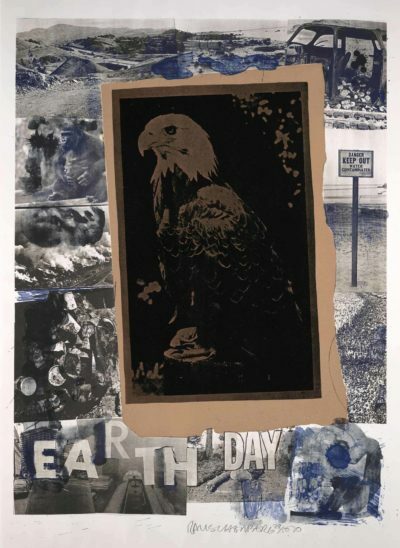 Robert Rauschenberg, American, 1925–2008, Earth Day, 1970. Color lithograph with collage. Gift of the Friends of the Princeton University Art Museum. ©Estate of Robert Rauschenberg/licensed by VAGA, New York. Also on view are works that link art and environmental activism: the first Earth Day poster, designed by Robert Rauschenberg in 1970; and two of the mirror shields used in 2016 by the hundreds of water protectors encamped at Oceti Sakowin Camp near Standing Rock, North Dakota, to protest the Dakota Access Pipeline construction project, which posed major threats to the region’s water and to ancient burial grounds. Artist Cannupa Hanska Luger (Mandan/Hidatsa/Arikara/Lakota) created a tutorial video shared on social media inviting people to create the shields and hundreds contributed. The shields protected activists and forced law enforcement to face their own violent behavior. For Luger, they also served as a point of human engagement and reminder that we are all in this together. Visitors can watch footage from a drone operation of the front lines, which documents a mesmerizing performance organized by the artist. These shields are part of Luger’s larger body of work that aims to connect people to the land around them and to consider the consequences of how we treat it. 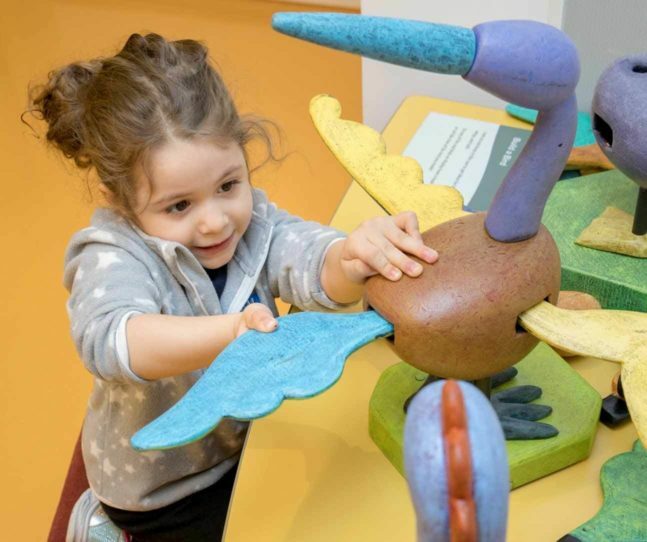 The exhibition opens on the heels of a landmark report from the United Nations that paints a dire picture of the consequences of climate change. Scientists warn that global temperatures could reach an irreversible tipping point in 12 years if the world doesn’t act dramatically to reduce the amount of carbon dioxide released into the atmosphere. The show also raises questions about the environmental impact of the materials used to create art. Consider the monumental abstract painting Intrigue by Morris Louis. The color-field painter used a mixture of acrylic paint and turpentine to pour ethereal washes of color directly onto his canvases. Regular exposure to the toxic fumes of turpentine likely played a role in Louis’ death from lung cancer at age 49 in 1962. By then, the turpentine industry had devastated forests and endangered the health of poorly paid, primarily African American, workers. We have an opportunity to explore the tension between the aesthetic beauty of the work versus the dangers presented by the materials, including a look at the human cost of their use and production,” says Bailly. “These are important conversations to be having around major works of art. Things can change. It’s not all doom and gloom. We want to follow the lead of the extraordinary artists included in this exhibition who have used their vision and their talents to inspire us to imagine new ways forward. The Opening Day Celebration on Saturday, Feb. 2 from 10 am to 5 pm includes art making, workshops and a 12:30 screening of the film Through the Repellent Fence,which follows Postcommodity, an indigenous arts collective, as they construct Repellent Fence/Valla Repelente, a two-mile long land installation that straddled the U.S.-Mexico border.